BELIZE CITY, Mon. Feb. 1, 2016–On Saturday morning, January 30, the C-Ray Cycling Club Saturday Race Series continued with the third race of the series. The field continues to grow every week. Alliance Cycling Team and the Choto brothers of C-Ray Cycling Team, all the way from Cayo, were present at the start line. A total of fifty cyclists lined up in six different categories: 28 Elite, 1 Female, 5 Category 4/5, 12 Juniors, 3 40-years+, and 1 50-years+. The course changed slightly this week. The race started, as usual, in front of Ready Call, turned at the Hattieville round-about, turned again at the junction with Philip Goldson Highway, and finished in front of CDS Gas Station. This week was definitely the fastest of the three weeks, clocking 28 minutes at the Hattieville round-about, and 54 minutes at the other end. Averaging 26.4 miles per hour, the race clocked a total time of 59 minutes 40 seconds. Apart from the Alliance Cycling Team and C-Ray Cycling Club, who were previously mentioned, also present at the start line were Benny’s Megabytes, Smart, Digicell-4G, Cabral/Marin Cycling, Smart Junior, WKC Strikers, FT Williams, and several unattached riders. At the start of race #3, Digicell-4G had a 2-0 record, with Gregory Lovell winning race #1 and Erwin Middleton winning race #2. There was talk at the start line that they wouldn’t win a third; healthy rivalry, of course; regular cycling chatter. There were countless attacks throughout the race; however, all proved to be futile. Every single break-away attempt was brought back before the runners could even establish a decent lead and get a comfortable gap. David Henderson decided that he would go for the first two station prizes, and once he jumped, no one was able to get around him. He claimed the first prize at Fresh Pond – 1 gift certificate from Da Bizz BBQ Grill, and the second at the Prison – $25 cash, courtesy Card Heating and Cooling out of New Jersey, USA. On the return, Henry Moreira of Team Smart grabbed the $25 cash, courtesy Card Heating and Cooling, at the Prison, and Brandon Cattouse won the prize at Fresh Pond. 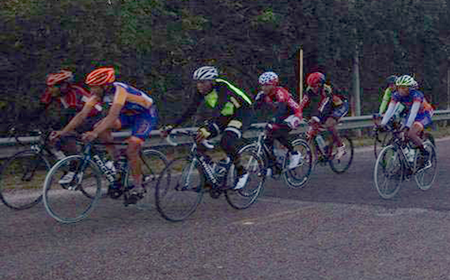 Immediately after the peleton turned at the junction with the Philip Goldson Highway, Herman “Hijo” Requena of Team Smart attacked. Similar to every other attack of the race, he was caught. This time, it was a collaborative effort from Erwin Middleton of Team Digicell-4G and Keion “Cavendish” Robateau of the Alliance Cycling Team. After Hijo was caught, Keion stayed on the pace and started the lead out for his team’s sprinter, Delawn Abraham, who was tucked in behind the known sprinters in the field. Ron McKenzie tried a “suicide” move a couple hundred meters away from the finish line, attempting to make a solo run to the line, knowing that he didn’t stand a chance amongst the sprinters who were there. He indeed committed suicide, as he was caught quickly, and from there, Brandon Cattouse started the sprint. It appeared that he started from too far as his speed started to decrease just several feet shy of the finish line. Byron Pope was coming with what seemed to be interminable power from behind, and passed Cattouse on the inside to take 1st place, while Darnell Barrow, who was coming with just as much force, also passed Cattouse and took 2nd place. Cattouse was forced to settle for 3rd. Pope is not known to be victorious when he comes to the tape with pure sprinters in the likes of Cattouse and Barrow, but he has proven that things will surely change in the 2016 cycling season. Special thanks to Stationery House Retail Outlet, Ordonez Bike Shop, Cattouse Trucking, KV Events Planning, Bruce Bike Shop, Freetown Drug Store, Milky Way Restaurant, Da Bizz BBQ, Card Heating and Cooling Inc., FT Williams, Fitzgerald “Palas” Joseph, Grace Kennedy. The Series continues on Saturday, February 6, at 6:00 a.m. Registration starts at 5:45 a.m. in from of Ready Call. Registration Fee: $5.00. CATEGORY 4/5 & FEMALE – 1st Ray Cattouse; 2nd Kenroy Gladden; 3rd Kaya Cattouse; 4th Wendell Williams; 5th Collin Maheia. ELITE – 1st Byron Pope; 2nd Darnell Barrow; 3rd Brandon Cattouse; 4th Delawn Abraham; 5th Leroy Cassasola. JUNIOR – 1st Ernest Bradley; 2nd Darien Anderson; 3rd Anthony Lewis; 4th Brian Sutherland; 5th Nashen Ysaguirre. 40 (years) + – 1st Collin Maheia. FEMALE – 1st Kaya Cattouse.